Planning a security system for your holiday home means taking into account many different factors. Not only do owners of holiday homes need to realise that they will not physically be in the area if something goes wrong at the house, but they must know too that if they are planning to rent out the holiday home then the security system must be one that each tenant can navigate. Most holiday home owners will have some advice about protecting your home, but whatever you decide remember that a combination of security alarms, awareness and network security will tackle some of the largest threats to a holiday home and/or tenants trying to enjoy their vacation. 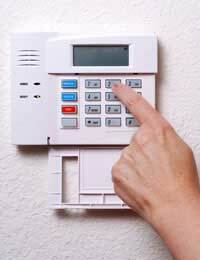 Security alarms, sometimes also called burglar alarms or even robbery alarms, are those that are installed to keep intruders at bay. These alarms are wired so that if movement is detected in the house they will begin to ring. Sometimes these alarms simply ring until the correct code is entered to turn them off, but some alarms may also be wired to send a message directly to a security or phone company. These companies will then try to contact the owner or other designated individual, and if they can not contact them then the police may be alerted. Many homeowners today find that security alarms give them peace of mind when they are away from their homes. For owners of holiday homes who will not be on their properties often, having an alarm that is serviced by an organisation may be a smart idea since it will provide local contacts even if the owner is away. Having a small sticker or placard on the premises letting others know that the house is protected by an alarm is also a good idea. In addition to alarms, awareness or common sense security is holiday home owners’ best defence in securing their homes. When no one is in the house it should be ensured that all windows and doors are closed and locked. Moving valuables and electronics away from windows is also a good idea. These actions can be just as important when someone is running to the shops as it is when the house is closed up for the season. Some owners may also choose to set lights on a timer so that it looks as though someone is in the house even when it is empty. If neighbours live in the area full time then holiday home owners may ask for them to “keep an eye” on their home while they are away, and of course bring them a lovely gift for their help when they are back in town. When physical security is taken care of, the last item that holiday home owners may want to address is network security or the security of any computers connected to the Internet from the holiday home. Some holiday home owners may not want to pay for an Internet connection or top up computer security if they will not be spending significant amounts of time in their holiday homes, but to skimp on a secure connection may be asking for trouble. If anyone in the house is going to connect to the Internet, find a way to run a safe, secure network. After all, arriving home from a holiday to find that someone has hacked your computer or online accounts will negate all of the relaxation of the trip! Security is an issue for holiday homes the same as it is for any home. If a holiday home is to be rented to strangers then instructions should be left regarding proper security procedures. At the end of each rental, security codes should be changed and noted in the instruction list. This will become routine after a while, so experimenting with a security system until it feels natural is a good idea.